by Chris Woodford. Last updated: November 28, 2018. There aren't many things that everyone in the world can agree on—but there's one thing virtually everyone would admit: gold is valuable. People have been making precious articles from gold for over 5000 years and even now gold bars remain the bedrock of the world's financial system. You only have to look at a piece of gold or feel how heavy it is to understand its enduring appeal. Even the name "gold" conveys something of the value we've come to attach to this precious metal: it comes from an Indo-European word ghel meaning to "gleam" or "shine." Where does this amazing substance come from and what makes it so special? 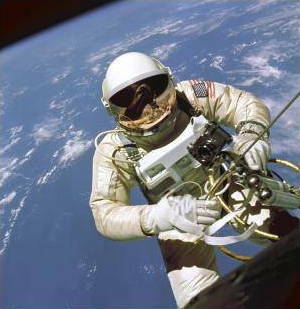 Photo: Gold in space: Ed White became the first astronaut to step into space and simply "let go" in 1965. He's attached to his spacecraft by a gold-wrapped umbilical line and his face is protected from the Sun's harmful rays by a gold-coated visor. Photo courtesy of NASA on the Commons. Photo: A sample of pure gold from Francomb Hill, Summit County, Colorado, United States. Photo originally by US Bureau of Mines courtesy of US Geological Survey. Gold is a soft yellow metal that's amazingly easy to work. It's far more malleable (easy to shape) and ductile (easy to draw into wires) than any other metal. You can beat a piece of gold into a "leaf" so thin that you'd need 100,000 leaves like that to make a pile 1 cm (0.4 inch) high. Gold's amazing softness also means you can draw a single ounce into a wire 64 km (40 miles) long! Despite being soft, it's very dense—even the small amount of gold in a wedding ring feels surprisingly heavy. The gold we use from day to day often needs to be much harder than this to survive rough treatment. Typically, we mix gold with another metal to make a substance called a gold alloy (an alloy is simply a mixture of a metal with one or more other metals and perhaps some other substances added too). We describe how much gold an alloy contains using a measurement called the carat (sometimes written karat). One carat is equal to 1/24 part: one carat gold is 1/24 gold and 23/24 other substances, 18 carat gold is ¾ (18/24) gold, and 24 carat gold is pure gold. The purity of gold can also be described with a measurement called the fineness. Pure gold is said to be "1000 fine," while something containing only ¾ gold (18 carat) would be described as "750 fine." The gold used in coins is usually 900 fine (90 percent gold mixed with 10 percent silver). How do you know how pure your gold is? There's usually a mark stamped into it (known as a hallmark) to indicate its purity in carats. One reason gold is so valuable is that it's chemically very unreactive. Air, heat, water, and most other substances have little or no effect on it. That's why chemists describe gold with words like "stable," "unreactive," "inert," and "noble"—all of which mean it's reluctant to take part in chemical reactions. Gold does react with acids and bases, however, and with cyanides and halogens. Source: Which countries produce the world's gold? 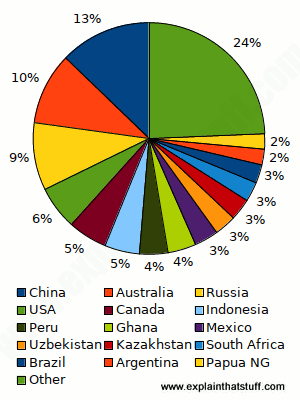 Chart shows estimated figures for world mine production, 2017. Source: U.S. Geological Survey, Mineral Commodity Summaries, January 2018. As prospectors throughout history will tell you, gold isn't that easy to discover: although you can find it in many different countries in all kinds of rocks and soils, it's only the 75th most common chemical element in Earth's crust. Given that there are only 90 or so natural elements, that's another way of saying gold is pretty rare. Since gold is so unreactive, it's possible (but unusual) to find pure gold in mineral deposits; typically most gold is combined with other elements in alloys such as electum (a mixture of gold and silver) and gold amalgam (gold and mercury) or combined with other metals including quartz, lead, and zinc. 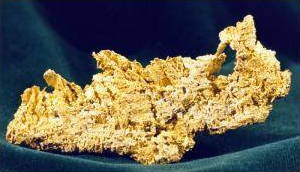 Most gold comes from three different kinds of mineral deposits: vein (lode) deposits (where the gold occurs in cracks in rock, a bit like the veins in blue cheese); placer deposits (where vein deposits are worn and washed away by rainwater and settle into the beds of streams); and as part of copper-containing minerals known as porphyry copper deposits. Surprisingly, gold is also present in seawater in quantities of a few parts per million—too little to make it worth extracting. How do we get gold out of the ground? 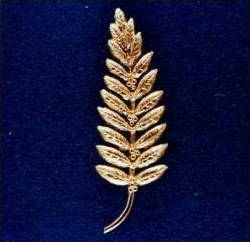 Photo: A gold olive branch (a traditional symbol of peace) left on the Moon by Neil Armstrong and the Apollo 11 space mission. Photo courtesy of NASA on the Commons. If you've ever watched movies about the Californian gold rush, you'll have seen grizzly looking prospectors panning for gold from placer deposits in streams. Panning means using a shallow pan to wash away sand and gravel until heavier nuggets of gold remain. Modern gold mining is far more sophisticated and happens on a much bigger scale. Placer deposits are mined using a scaled-up version of panning. Huge mechanical excavators and dredges pull out vast amounts of material from the bed of a river or creek. The material is then washed and shaken to separate the gold out from the useless waste (known as gangue). Gold mined from underground deposits is mixed in with gravel and rock and has to be extracted by a mixture of physical and chemical processes. The exact process varies from place to place and depends on what other elements the gold is combined or mixed in with. Typically, gold-containing ore might be crushed, dissolved in mercury or cyanide, smelted, roasted, or subject to various kinds of filtering (including floatation and gravity separation—where heavy gold is allowed to settle to the bottom of a container) before the gold is pure enough to be melted and shaped into bars called ingots. Gold can be purified by chemical means or by electrolysis (passing an electric current through a gold-containing solution). Artwork: The periodic table of elements showing the position of gold (Au). With 79 protons, it's quite low down the table, which explains why it's so heavy (lead, symbol Pb, a very heavy metal, is just three positions to the right). Silver is the element directly above gold, which is why it's the lighter of the two. Silver, gold, and copper are all good conductors of electricity and sit in the same group (column) of the table. Atomic number: 79 (one gold atom contains 79 protons, 79 electrons, and 117 neutrons). What do we use gold for? Where does all the gold go? Jewelry is still the biggest use for gold, though much of the metal finds its way into electrical and electronic equipment. 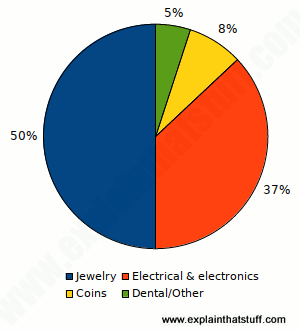 Estimated percentages for end uses of gold in the United States, 2017. Source: U.S. Geological Survey: Mineral Commodity Summaries: Gold, January 2018. The majority of gold is still used for making jewelry, decorative items (often coated in gold leaf or paint), and currency. Since it's a very good conductor of electricity, gold is also widely used in electronic circuits (you'll often see hi-fi buffs talking about using gold-coated cables to hook up loudspeakers). There are many other important industrial and scientific uses: astronauts, for example, have a thin-coating of gold on their visors to protect their eyes from solar radiation. Gold's durability and inertness also make it an ideal substance for various kinds of dental repairs (just under 5 percent of the gold consumed in the United States each year ends up in people's mouths!) and a variety of medical treatments (including cancer therapy and treatment for arthritis) also depend on the versatility of gold. 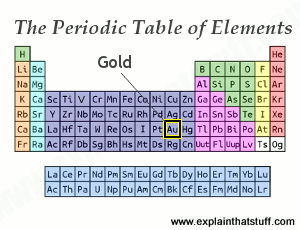 Gold: Basic data from the excellent Web Elements Periodic Table. Gold: An interesting 12-page introduction to gold from the US Geological Survey. It's available as an illustrated PDF brochure or a simple text-only HTML web page. USGS Minerals Information: Gold: Current statistics and other information about US and worldwide gold production. The New Case for Gold by James Rickards. Portfolio/Penguin, 2016. Is gold, ultimately, the only safe currency? The Power of Gold: The History of an Obsession by Peter L. Bernstein. John Wiley, 2012. A broader look at the part gold plays in world culture, politics, and financial affairs. Gold: The Once and Future Money by Nathan K. Lewis. John Wiley, 2007. Examines the central role gold has always played in the world financial system. Gold by Therese Shea. Gareth Stevens, 2014. A short, 24-page overview for ages 7–10. Gold by Brian Belval. Rosen, 2007. A basic 48-page introduction, useful for school projects for ages 9–12. Gold by Sarah Angliss. Marshall Cavendish/Benchmark, 2000. A 32-page overview of gold's chemistry, physical properties, and applications, also for ages 9–12. Comic Relief and Fairtrade back ethical gold mining in east Africa by Sarah Butler. The Guardian, 1 October 2017. A fifth of the world's gold is produced dangerously and inefficiently by small-scale miners. Is there an ethically better way? Why we're flushing £13m of gold down the plughole each year by Chitra Ramaswamy, The Guardian, 16 November 2015. Huge amounts of gold, silver, and platinum are finding their way into sewers from hand-washing and teeth-brushing. Why do we value gold? by Justin Rowlatt. BBC World Service, 8 December 2013. Can the periodic table explain why gold is so valuable? Why has gold lost its shine? by Patrick Collinson, The Guardian, 31 August 2012 and Why the price of gold is rising: BBC News, 13 October 2009. Compare these two articles to see how the price of gold dramatically rises and falls from year to year. Banking on Gold by Murray Cox. BBC News, 8 October 2008. Why investors always turn to gold in tough economic times. In pictures: Brazilian gold mine: BBC News, 2007. A short photo article showing how surprisingly little has changed in some Brazilian gold mines.